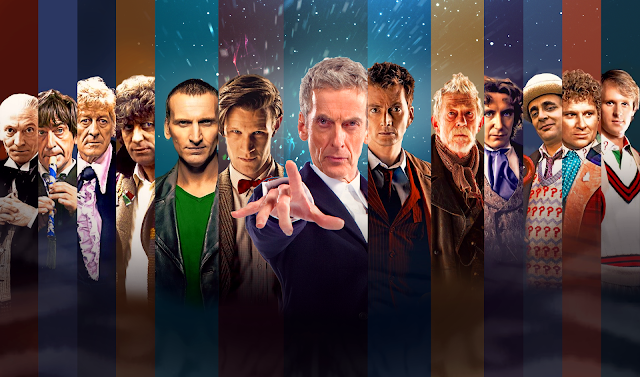 I was invited to write a guest post on two of my favorite things: Theology and Doctor Who! Here is the beginning of that post. Please hop on over to Hope N. Griffin's blog to read the rest of it! I love theology (studying/thinking about God) and I love Doctor Who. But do they go together? I say yes! My obsession with Doctor Who started a few years ago when several good friends of mine with similar sci-fi and fantasy interests fell in love with Doctor Who. I figured if they loved it so much, so would I. And I was right. For those who don’t know, Doctor Who originally premiered on the BBC in 23 November 1963. (The very next day after C. S. Lewis died in fact. Coincidence? Or could Lewis have been the original Doctor… ;-) The “Classic Who” era ran from 1963 until 1989, and then the Rebooted Series (sometimes called the “New Who”) launched in 2005 and is still going strong as the longest running and most successful sci-fi series in television history. The show follows the Doctor, an ancient Time Lord with the power to regenerate into a new body whenever he is mortally wounded. As silly and fun as the show can be at times, Doctor Who has a lot of heart (no pun intended, though the Doctor himself does in fact have two hearts). Throughout the adventures in time and space, themes of love over hate, are interspersed with those of wonder and curiosity, belief and goodness. The nature of our choices and free-will are explored along with themes of war vs anti-violence. Doctor who navigates the complexities of morality in an always changing universe. Please read the rest over at Hope N. Griffin's page!